This is a fascinating insight into the work of one of our greatest thinkers. Thomas Robert Malthus (1766–1834) is best remembered today for his theories on the menace of over-population; this first ever full-length biography shows him also in his role as one of the founders of classical political economy, still a controversial figure in the history of economic thought. Based on exhaustive research among contemporary sources, it gives an account of Malthus’s two careers, as an economist and as a professor at the East India College. Patricia James describes how, at the East India College, Malthus was influential in the establishment of an incorruptible Civil Service and the modern system of written examinations, in circumstances which seem almost farcical today. She gives an account of his family and social life, which was full of warmth and variety, with an abundance of ‘characters’ as well as many famous men. People nowadays are inclined to argue in a vacuum whether Malthus is ‘right’ or ‘wrong’ about population outrunning subsistence, and about the adequacy of aggregate demand in a capitalist society. Patricia James shows him in his historical setting, so that the book is a study both of the man and of the age in which he lived. 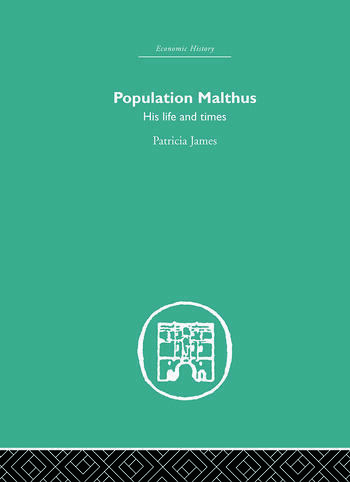 She believes that, paradoxically, if we view Malthus’s works as the period pieces they are, it becomes more and not less easy to see their relevance to our own problems. Although Malthus’s search for basic principles in a changing world was confused and erratic, his ideas are still illuminating to those who prefer investigation and reappraisal to the mere reiteration of dogma. This text was first published in 1975.